SAN FRANCISCO, Calif. /California Newswire/ — The California Council on Economic Education (CCEE) announced today that the four-student team from San Rafael High School, in San Rafael California, led by instructor Abigail Shapiro, won first place in the 2013 MoneyWise Teen Contest. The winning team included students Rebecca Brown, Frances Casey, Natasha Sharp and Roslyn Yeager. The second place award went to Media Academy of San Rafael's High School students: Deny Cruz, Christian Garcia, Erik Rodas and Morgan Russell led by instructor Jeannine Thurston. Rio Americano High School of Sacramento, Calif. placed third, with the winning team: Mondana Koshfam, Max Hayden, Victoria Quach and Colin Savage led by instructor, Allie Armstrong. The annual contest rewards mastery of understanding of the proper use of credit cards, credit scores and the banking system to become financially successful. Students uploaded their videos in which they present their understanding of Human Capital, Scarcity and Skills they have learned to make better financial decisions. Based on the international, award-winning web based program, the MoneyWise Teen Contest involves students of all skill and knowledge levels, connects creative students with economics and personal finance and helps students become college and career ready. More information: http://www.ccee.org/teaching-economics/student-contests/moneywiseteen-contest/ . The San Rafael teams competed against 33 other high schools and hundreds of students across Northern California. 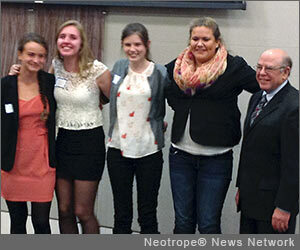 Instructor Abigail Shapiro and the students were awarded cash prizes as were the 2nd and 3rd place teams. "I will continue to use CCEE materials with my students for years to come. Our school created 15 videos for the contest, it was difficult to choose which video to submit," said Ms. Shapiro. The contest, co-sponsored by Franklin Templeton Investments, Bay Area Financial Education Foundation, US Bank San Francisco and California Council on Economic Education (CCEE), is the largest such competition in California. Wynne Lum, Senior Vice President Bank of America; Linda Wendel, Head of Community Relation Franklin Templeton and Navdeep Sood, Vice President State Bank of India, CA served as judges at this year's event. "We are delighted to be able to work with the Federal Reserve Bank to bring this contest to Northern California and we are grateful to our sponsors for their support for our students," said Jim Charkins, Executive Director, California Council on Economic Education (CCEE). "The need for programs such as the MoneyWise Teen is obvious and CCEE is happy to present this opportunity to our Northern California high school students and teachers." The competition is part of CCEE's many efforts and activities to celebrate April as Financial Literacy Month by bringing together financial literacy advocates and recognizing students' achievements. The California Council on Economic Education (CCEE) is a nonprofit organization dedicated to advancing the economic reasoning and financial literacy of California students. CCEE's focus is preparing students to participate in the global economy by providing educational programs and materials to K-12 teachers. More information about CCEE's professional development workshops, programs and student contests can be found at http://www.ccee.org/ . * Photo Caption: Rebecca Brown, Frances Casey, Natasha Sharp, Roslyn Yeager, Jim Charkins.